1. The flag is removed from the pole or surface (table, coffin) and held by the folding party. 2. Take the bottom half of the fold and bring it up towards the top; the result is to show all three stripes even. 3. 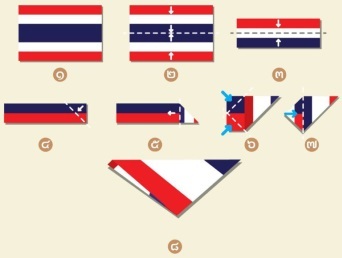 The bottom and bottom of the flag is folded to meet in the middle white stripe. This makes the red and blue only visible. 8. The flag is completely folded and can be used for storage, display or presentation to the next of kin (in case of a funeral).